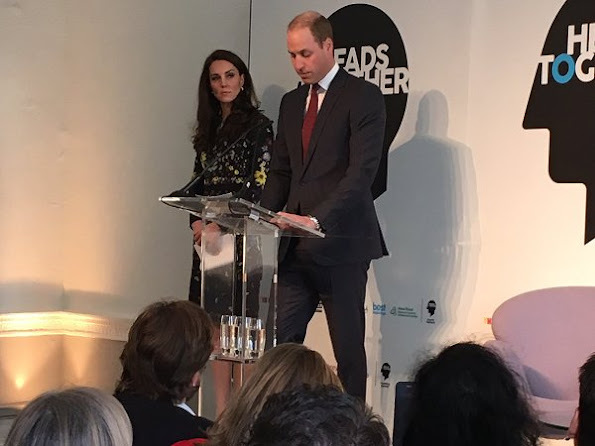 Duchess Catherine of Cambridge, Prince William and Prince Harry attended a briefing for Heads Together ahead of the 2017 Virgin Money London Marathon held at ICA on January 17, 2017 in London. 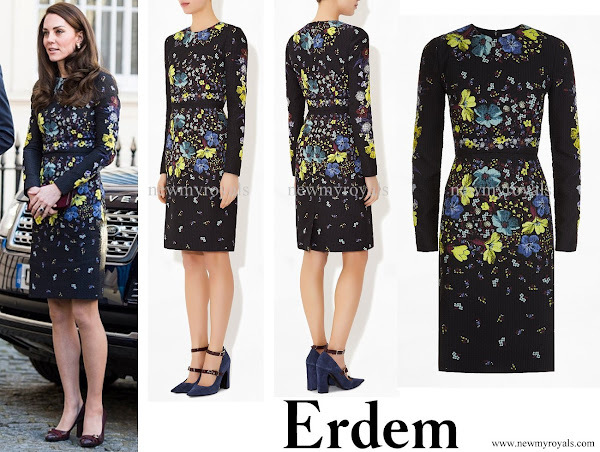 The Duchess wore ERDEM Evita Dress. Really like the whole look. Love the dress! I would wear it myself. I am glad she's gone back to a shorter hemline, which is much more youthful than the granny style dresses she wore lately. 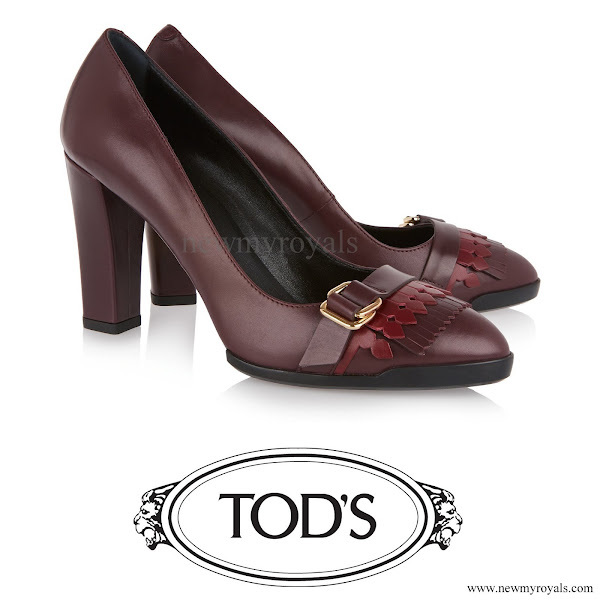 It would have needed another type of shoes than these classic Tod's, but of course not her favourite blue suede Gianvito Rossi Pumps, something modern like the model. She is young, she could in general be a little more experimental in her style instead of always playing the safe game. For the make-up, good that she left the black kajal behind, she looks much fresher. But her hair is definitely too long and heavy, it almost looks a if she's pulled forward by the weight of it. 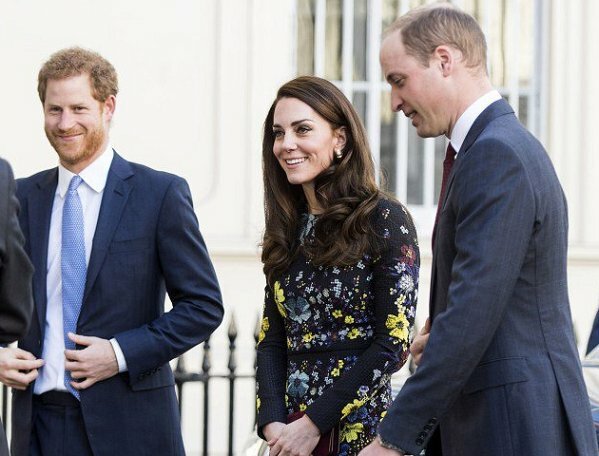 I start to feel sorry for Prince Harry, always the third wheel of the Cambridges. Time for him to start his own family. He would be a great dad. She is actually an American Kristina. She lives in Toronto because the US show Suits is filmed there. She is from California. It does appear to serious. True, Diane, I was not aware of her either. However, I have friends who do watch that cable channel and love the show "Suits" and think Meghan is great. She was born in Los Angeles, California on August 4, 1981. Her first name is actually Rachel. Meghan is her middle name. Fun fact: she has the same birthday as Queen Elizabeth, the Queen Mother and US President Barack Obama. 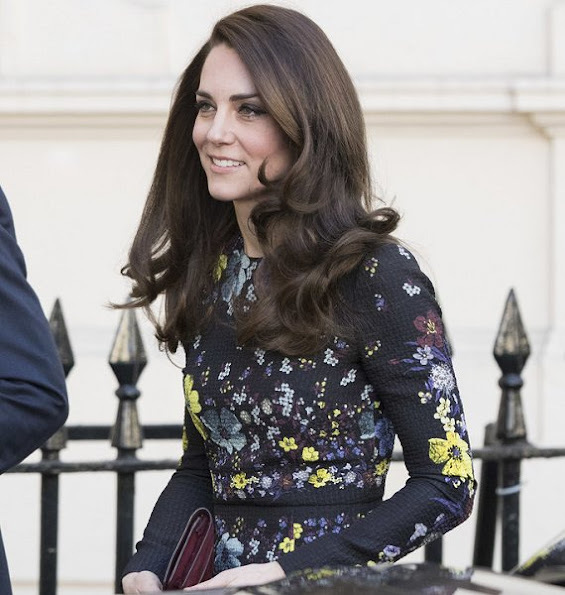 Pretty girl, reminds me a bit , just a bit of Duchess Catherine's sister. Agree, Kristina, on Meghan's resemblance to Pippa Middleton. Catherine has much softer make up here and that makes her face look really pretty. Agree, Kristina. Her makeup is better here. I hope she has left that harsh & heavy black eyeliner behind forever. The Duchess of Cambridge looked fantastic, elegant and very chic. Love this dress, beautiful material and colours. I love this dress. This is the way to wear florals in winter. And she looks lovely - and younger - with the new make-up look. I don't like the dress or her shoes. Love it all! The dress is wonderful! The Tods are so cute. There are some closeups off the fabric that really show how great the shoes and clutch help pull out that color. Shoes are great but the colors are not at all compatible with the dress: earth tone shoes with a crisp black jewel tone print dress. Also a duotone shoe with the vibrant print. And the modern geometric texture of the dress clashes with the classic tailoring of the shoe, too much texture and not compatible. The purse & shoes are great; the dress is great. Together not great. Her hair looks nice here. It looks as though she's had some layers and conditioning. The curls gift some lift. A great improvement from recent appearances. Her makeup is very nice too. Much less stark and better blended. I like the whole combo togeather and alone. Would love to have that dress and shoes myself. The duchess looks good. But im patiently waiting for her to WOW me. Very beautiful dress, looks good on DC, but the shoes are from another story (dress is romantic and shoes sporty elegant). Her face looks really youthful this time. Like her! Agree with you Masha about shoes. I think model ( on the photo) has good shoes to that dress. 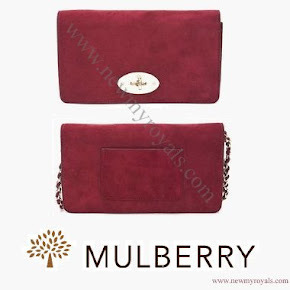 Modern and style for woman Catherine's age. Overall, a well groomed look. I do wonder if Catherine had her hair at shoulder length, would it be easier to maintain. Her petite frame seems to be swallowed up by too much hair. Not a criticism more an observation ! Otherwise, she looks good.